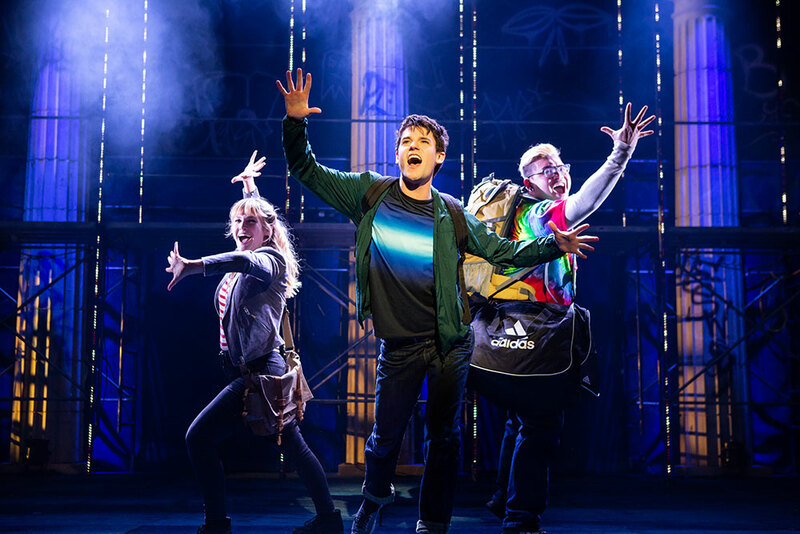 I missed seeing The Lightning Thief musical, based on Rick Riordan's novel, when it was in New York before so I was thrilled to see that it was coming to the Beacon Theatre in New York City on its US Tour. Some of the creative team from Broadway's Be More Chill also worked on this show including book writer Joe Tracz and director Steven Brackett. The music and lyrics are written by relative newcomer Rob Rokicki. Perhaps the best thing about the show is its obvious love for the original book. It sticks fairly close to the plot of the novel, while obviously condensing things for the sake of time. It also hints at plot points from the rest of the series, even though there will obviously not be sequels to the musical. 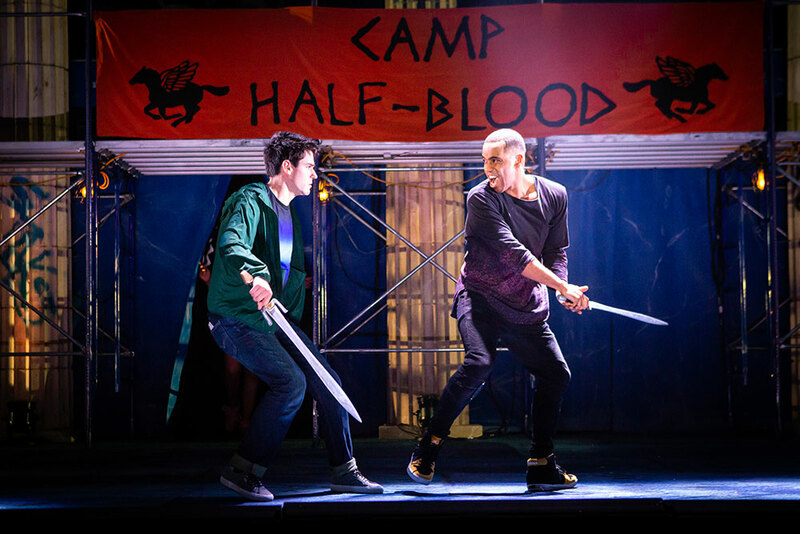 If you hated The Lightning Thief film because of its blatant disregard for the book, then you will love this musical. For anyone not familiar with the Percy Jackson series, this musical tells the story of a young boy who finds out that his dad is actually absent because he's a Greek god. After he's attacked by his substitute teacher (who is actually a monster), he loses his mom to another terrifying creature while on his way to Camp Halfblood -- a camp where demi-gods go to train. However, he's soon accused of a crime by another god and has to travel to the Underworld with his best friend Grover (who is actually a satyr tasked with protecting him) and the spunky daughter of Athena, Annabeth. The musical's first production was in 2014 in New York before an extended and updated version debuted in 2017 at the Lucille Lortel Theatre. It opened its National Tour in April of 2018 and is making its way across the United States. The production has a homemade feel to it that is somehow charming rather than amateur. The fights are staged creatively by Rod Kinter and the scenic design by Lee Savage is sparse but effective. I love that Sydney Maresca's costume designs for the Half-bloods feel age appropriate while she uses some really cool methods to bring the mythological monsters to life. 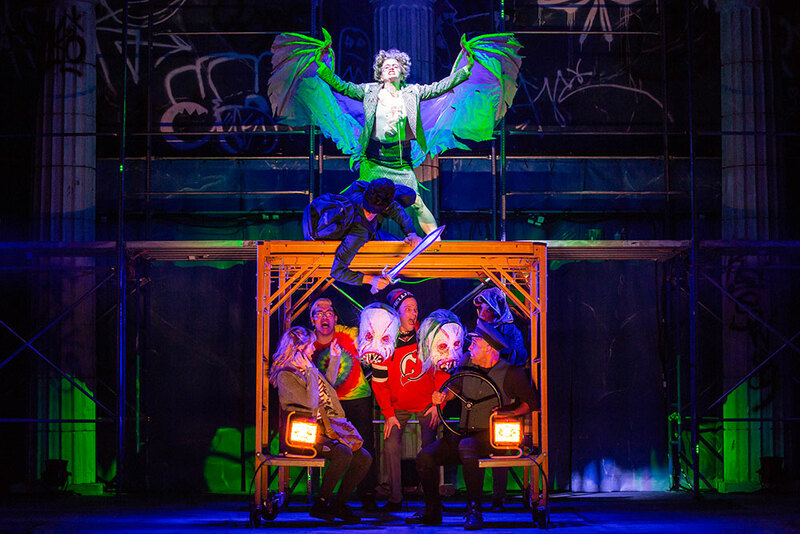 The lighting design by David Lander and the sound design by Ryan Rumery do a lot to add to the show's atmosphere; it starts with a crack of thunder that made everyone in the audience jump out of their seat, myself included. This lack of commitment to realistic design actually made the show work a lot better for me; I was much more impressed by how they managed things with less special fancy effects. The design of the show almost makes it feel like something that a child reading the book would dream up (but luckily not like something that a child could accomplish). It feels beautifully theatrical, not like it's trying to be a film. It's easy to forget that the show has a cast of seven actors because many of them are unrecognizable amongst the roles that they play. James Hayden Rodriguez stands out as the charismatic Luke (and other characters) while Ryan Knowles's Chiron and Medusa are equally delightful. Jorrel Javier is hysterically funny as both Percy's best friend Grover and grumpy camp counselor Mr. D (yes, that's short for Dionysus). While his peppy "Another Terrible Day" is hilarious, he brought me to tears with "The Tree on the Hill." 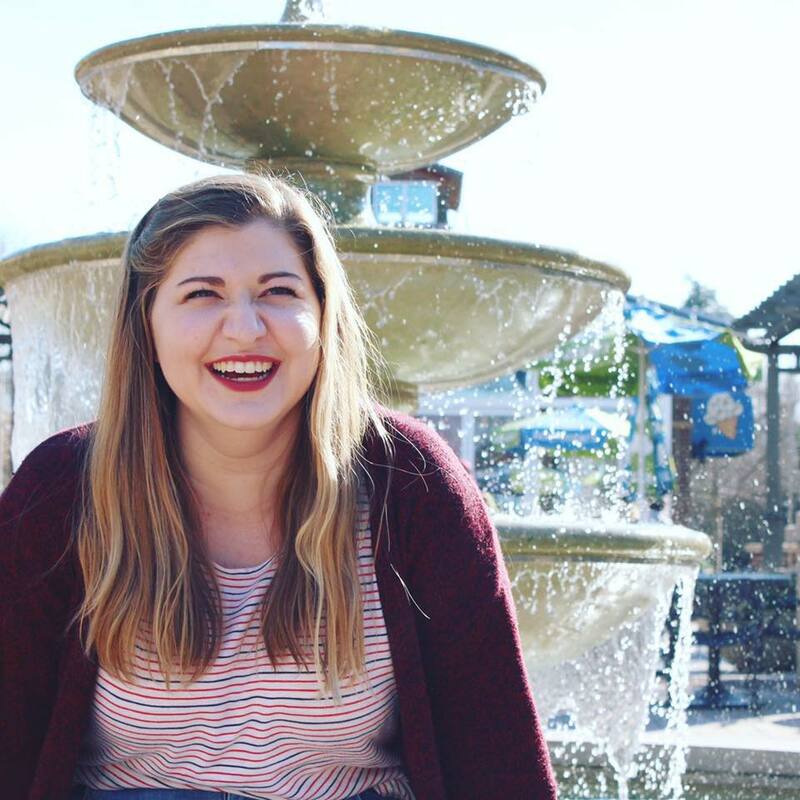 Kristin Stokes is everything I ever dreamed of for the smart but insecure Annabeth Chase. For anyone who was bothered by Annabeth's characterization in the movie, worry not because Kristin clearly has a strong understanding of the character, both her spark and her hubris. (I'm also thrilled that Annabeth even calls Percy "Seaweed Brain"!) Her big solo "My Grand Plan" made me cry and wonder where this song was when I was a pre-teen girl confident in my own intelligence but not much else. When they first announced a Percy Jackson musical, I joked that Chris McCarrell (who I had previously seen as Marius in Les Mis) would be the perfect Percy. So imagine my joy when not only was he cast in the role, but he turned out to be the perfect Percy Jackson that I had dreamed of. 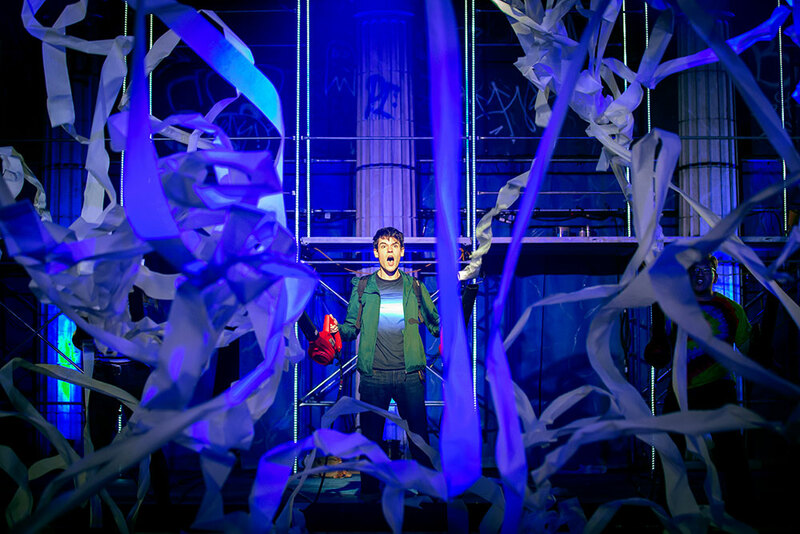 Chris strikes a perfect balance between a defiant and awkward teen and a charming son of a god and has the audience enthralled every moment he's onstage. His big solo "Good Kid" is an absolute show-stopper and easily my favorite number in the show. While the solos in the show are amazing, there are also great ensemble numbers. The show opens with "Prologue/The Day I Got Expelled" which sets a great tone for the rest of the musical. "Drive" is one of the numbers between Percy, Annabeth, and Grover that are super fun and also do a beautiful job at building the camaraderie between the three. Another favorite of mine is "Bring on the Monsters," the awesome and uplifting closing number. Maybe The Lightning Thief isn't groundbreaking musical theatre. It doesn't have the most intricate set design or the best score I've ever heard. 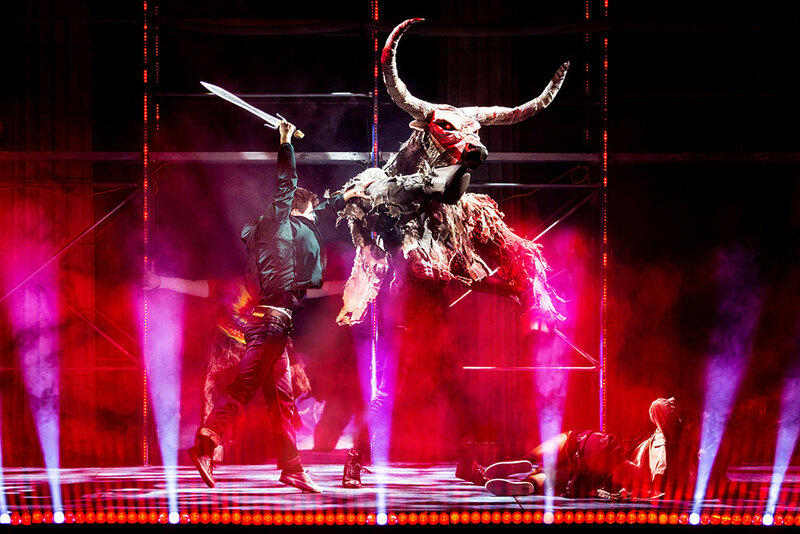 But it is the best book to stage adaptation I've ever seen in terms of capturing the feel of a book and is the most fun I've had in a theatre in a long time. Most of all, I love it because it brings the characters that I spent so much of my childhood wrapped up in to life with all the love and respect for them that I ever could have hoped for. The Lightning Thief is currently on tour across the US.